Thank you for helping us to avoid censorship. Your donation, no matter how small, is important to us. We need to maintain the servers and office staff to provide readers with the high quality information that has gained us a solid reputation and a readership of over one million visitors every month. Because we are not afraid to investigate almost any topic, we will inevitably offend some people whose behavior or ideas are contrary to our reporting. We always try to be fair and to publish opposing views. But some times, angry readers complain to our advertisers and jeopardize our ad revenue. This doesn't happen very often, but when it does it can pose needless problems that threaten our existence on the web. Your kind donation enables us to continue to investigate and report on the important issues that face our civilization. 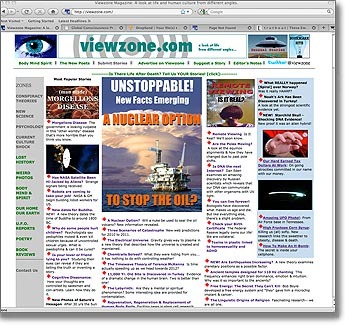 In addition to your financial support, viewzone.com welcomes your intellectual input. We accept stories, story ideas and suggestions as well as criticism and opposing views to information or ideas we have presented. We try to get it right, but if we don't, we expect to hear from you. Again, thanks for your continued support. We have been on line since 1996 and we hope to continue to always be here for you.